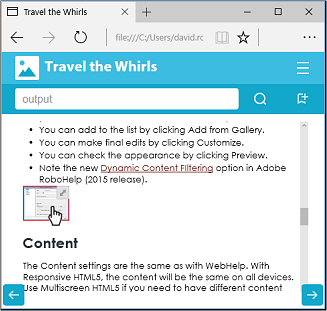 Adobe RoboHelp (2017 Release), part of the latest version of Adobe Technical Communications Suite, was announced recently with the usual marketing fanfare. So what are the main new or improved features that will excite technical writers like myself? And do the enhancements add up to a genuine “major” update? I’d have preferred to see a wider variety of options: layouts, interfaces, colours, etc., similar to WebHelp’s range of skin templates, but at least the two new layouts definitely do offer useful additional options like a search-driven design, an icon-based interface, frameless output, enhanced 508 compatibility, and users being able to bookmark their favourite topics. But you need to choose your layout carefully as each layout offers notably different features and appearance. The second enhancement that caught my eye is Search Auto-complete. This is a Google-style way of using a search box, and something which I have been asked about on recent RoboHelp training courses I’ve run. So now, instead of having to type the full search term and press Enter and hope the topic you’re interested in is listed in the search results displayed, you can instead see the available search terms as you type in the search box. The search suggestions displayed as you type are ranked based on how often that term appears, enabling you to adjust which term you’re searching for. It even suggests spelling corrections. And, if your users search for more than one word the results are now an “and” list not an “or” list, so fewer and more accurate results are shown. 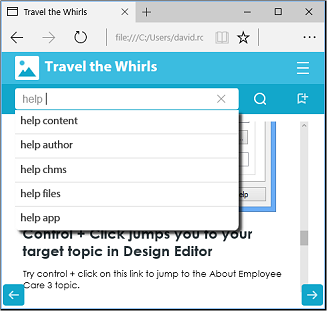 The restrictions are that this feature is only available in Responsive HTML5 output, not WebHelp or any other output option, and not even for every screen layout. The third feature I’m pleased to see added is what I call Expanding Image Thumbnails. 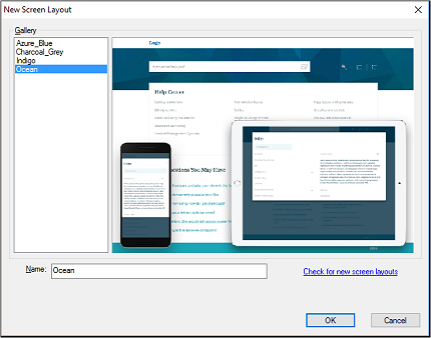 One of the ever-present choices for technical authors who create help systems is what to do with screenshots – they can be useful to end-users but they often take up too much space on the screen. I have tended to hide them within a drop-down so they can be shown if needed but don’t consume vital screen real-estate. But MadCap Flare output has for some time provided a better solution, where a small version of the screenshot image is shown which the user can click on to see the full-size image if they want to. It’s great to see the equivalent feature now added to RoboHelp 2017 (though with a less polished user experience) providing you don’t mind creating an image style and tagging it to all relevant images. a quick way of toggling the values of your User Defined Variables whilst editing topics. Most of these other features are not significant, for me, nor for many I suspect. If you’re producing Responsive HTML5 output, then the features described above are very welcome particularly the search facility and the new layouts. I also particularly like the expanding image thumbnails. That said, I’d like to have seen more from the release, but as a long-term user of RoboHelp, I would say that wouldn’t I? 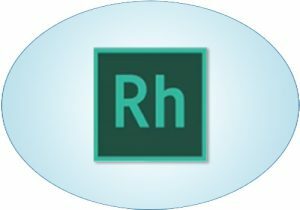 Perhaps more of a ‘minor-major’ update, but I’d appreciate your views of RH2017’s new features. Have I missed out some important or cool features?